1. Prepare Shells: Preheat oven to 375°. Unwrap and unroll phyllo dough; cover phyllo dough with clean damp towel to prevent drying. 2. Transfer 1 sheet to work surface and spray lightly with cooking spray, keeping remaining sheets covered with damp towel. Repeat 5 times, placing sheets on top of first layer, for a total of 6 layers; cut into 4 equal size rectangles. Form each into 4 muffin cups in muffin pan, pressing firmly against bottom and sides. Repeat with 6 more phyllo dough sheets and cooking spray. Bake 8 to 10 minutes or until lightly browned. Let cool. 3. Prepare Filling: In small bowl, with rubber spatula, fold together all ingredients. With whisk, stir filling until well combined. 4. Prepare Topping: In small saucepan, melt jelly. Do not let boil. 5. Transfer filling to large zip-top plastic bag with bottom corner snipped off (or use a spoon), and evenly divide filling into shells. 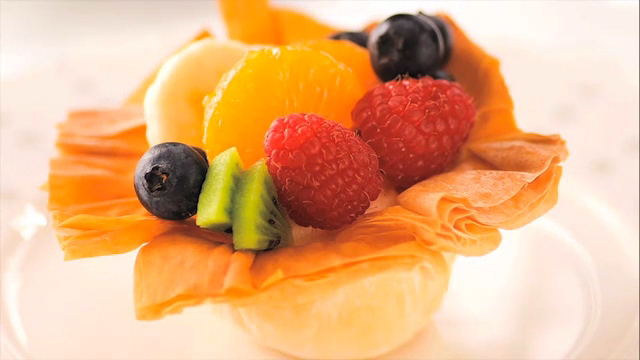 Arrange fruit of choice over filling and brush fruit with jelly.